Moderate rain (totál 13.0mm), heaviest el sábado por la mañana. Very mild (max 11°C el sábado por la mañana, min 5°C el domingo por la mañana). Winds decreasing (rachas desde el SSE el sábado por la noche, calma por la noche de domingo). Light rain (totál 7.0mm), mostly falling el martes por la noche. Freeze-thaw conditions (max 11°C el martes por la tarde, min -3°C el miércoles por la noche). Winds increasing (calma el martes por la mañana, rachas desde el OSO por la noche de martes). La tabla anterior muestra el pronóstico de tiempo para Whiteface Mountain (Lake Placid) en la altitud específica de 1352 m. Nuestros modelos meteorológicos sofisticados permiten prever pronósticos para la cumbre, la mitad y la base de Whiteface Mountain (Lake Placid). Para aceder a los pronósticos de tiempo a otras alturas, pinche en la navegación en la parte superior de la tabla. Para una visión general, consulte el Mapa meteorológico de United States. Whiteface is home to the greatest vertical drop east of the Rockies so undoubtley is one of the best if not the best ski resort in the Appalacians. When I went there last year there was plenty of snow (didn't stop snowing for 3 days!) and cold weather. The skiing mountain itself doesn't have any accommodation at the bottom (correct me if I'm wrong) but the nearby Olympic host Lake Placid town is a perfect base. The skiing is VERY good for the eastern seaboard as there is a massive variety and very good count of pistes for such an unknown resort. My favorite of which is the new Wilmington trail down the east of the mountain which is the newest trail coming up as it was only put up with a fast quad serving it and along with new trails such as 'look out below' (even for an experienced skiier was almost impossible with moguls the size of houses). 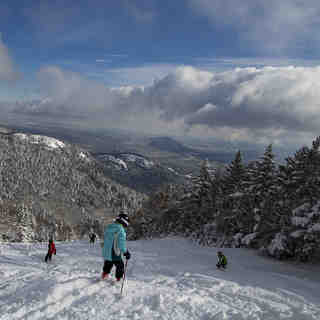 Alll in all, Whiteface cannot be overlooked as a brilliant resort!